We aim to cater for the needs of all visitors. Our Guest House is situated on Columbus Ravine which is on the A165 in the North Bay close to Peasolme Park. The house is semi-detached; therefore there are some features which might make access difficult for those with limited mobility. We are located on a slight incline and have 8 rooms on Three levels. Rooms are not suitable for wheelchair users. We are located on Columbus Ravine which is on the A165 in the North Bay close to Peasolme Park. The nearest shops are around 200 yards away. The nearest railway station is in Scarborough town centre, which is approximately 1 mile away. Station taxis are usually available from the station but we can book one for you in advance if required. There are several local taxi companies; we can make bookings in advance for you. 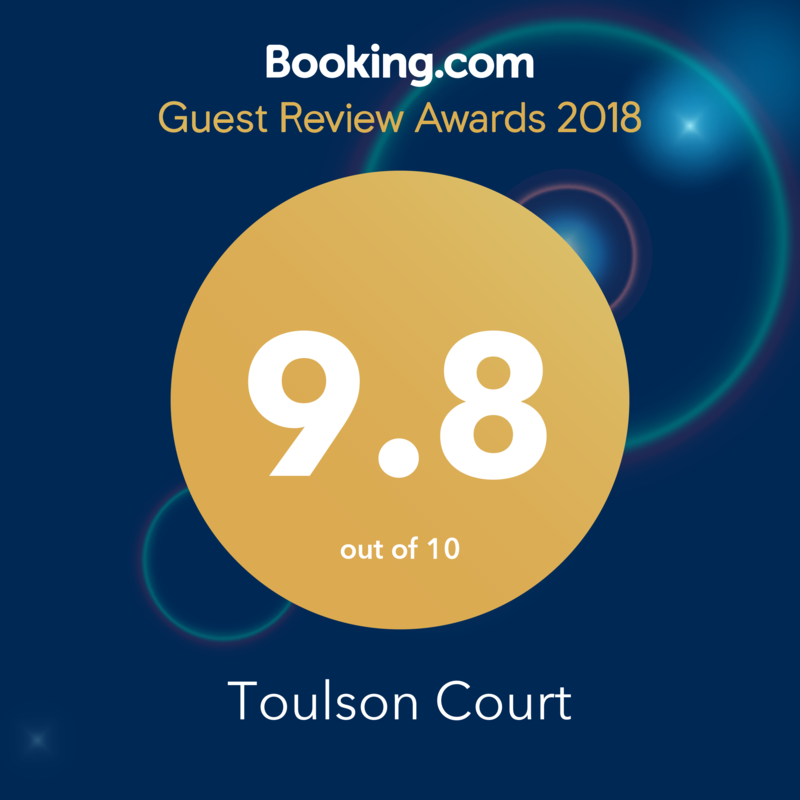 Our website www.toulsoncourtscarborough.co.uk provides pictures of our accommodation and further information about the services we provide. You can contact us by telephone or e-mail. Please see the “Contact Information” section of this document for full details. We can accommodate dogs but only with prior arrangement. To ensure your accommodation is ready we ask that guests do not normally arrive before 2pm, earlier arrival may, however, be possible by prior arrangement. Parking is available at the guest house car park, and on the main road in clearly marked areas. Before entering the guest house there is one step up. We offer assistance with luggage. The front entrance leads into the hall. The front door is always open however the inside front door is closed, please ring the bell on your arrival. Guests are escorted to their rooms and will have the facilities explained prior. The breakfast room is situated in front of you just off the hallway upon entry. If we are out at any time we have a ‘how to contact us’ message on the Kitchen door. Carpets are fitted throughout. The hallway has the breakfast room situated in front from the entrance. There are 15 steps (stairs) to the first floor which has a handrail on the left hand side. The stairs are carpeted. We have 1 guest bedroom on the ground floor bedroom 1(please see section ‘bedrooms’ for more information). We have 4 guest bedrooms on the first floor bedrooms 2,3,4 and 5(please see section ‘bedrooms’ for more information). There is a further 6 steps (stairs) before reaching bedrooms 6, 7 and 8 with a handrail to the left. The house is centrally heated throughout however temperatures can be adjusted in each room to suit individual requirement. Access to the patio area is through the breakfast room and conservatory. Behond the breakfast room is the guest conseratory equiped with cane furnature, and TV Freeview. A selection of local maps, magazines, books and videos are available. For children games, books and videos are available. * Breakfast is served in the breakfast room on the ground floor. Furniture layout is flexible and can be repositioned on request. There are 8 tables 74cm high with 4 legs. The room is fully carpeted. The chairs are without arms 45cm from floor to seat. We do play background music. At table service is offered. Vegan, vegetarian, gluten free and most other diets are catered for. There is no smoking throughout the premises. Tea, coffee, hot chocolate, are provided. We also provide a hairdryer, sewing materials, shower caps. A first aid kit is also available. We provide liquid soap, shower gel/ shampoo and hand/body lotion. We provide cotton bedding. Hand towels and bath sheets are provided. All pillows are synthetic with cotton covers. There is hanging room for clothes, chest of drawers and bedside cabinets/ shelves in each room. There is additional seating in most rooms. Each room has a alarm clock, combo TV and Video. Carpets are fitted to all rooms with tiled floor in all en-suites. Situated to the front on the ground floor with bay window aspect has 2 off 3” single beds with access from both sides or 6” double with access from both sides. En-suite consisting of a shower, WC and hand basin. Additional seating area of 2 chairs. Situated to the rear of the house up one flight of stairs with a 4ft 6” double bed height 46cm with access from both sides, and a 3” single bed with access from one side only. En-suite consisting of a shower, WC and hand basin. Additional seating area of 1 chair. Situated at the rear of the house up one flight of stairs with 2 off 3” single beds height 56cm with access from one side only or 6” double with access from both sides. En- suite consisting of a shower, WC and hand basin. Situated to the front of house up one flight of stairs with bay window aspect has 4ft 6” double bed height 54cm with access from both sides. En-suite consisting of shower, WC and hand basin. Additional seating area of 2 chairs. Situated to the front of house up one flight of stairs with 4ft 6” double bed height 60cm with access from both sides. En-suite consisting of shower, WC and hand basin. Situated on the top floor at the rear, up two flights of stairs with a 4ft 6” double bed height 55cm with access from both sides. En- suite consisting of shower, WC and hand basin. Additional seating area consisting of 2 chairs. Situated on the top floor at the rear, up two flights of stairs with a 4ft 6” double height with access from both sides and a 3ft single height with access from one side. En- suite consisting of shower, WC and hand basin. Situated on the top floor at the front, up two flights of stairs with a 4ft 6” double height with access from both sides and a connecting door to two 3ft singles height with access from one side only, En- suite consisting of shower, WC and hand basin. Additional seating with 2 chairs. We have a seating/ patio area to the rear of the house We provide a patio table and 4 chairs for guests to use. There is a fire extinguisher in the entrance hall and two others on the middle landing and top landing. These appliances are checked yearly and the the fire alarm is checked weekly. In the event of a fire there is an alarm bell and emergency lighting. Please advise us if you have a hearing impairment that might prevent you hearing these warnings. The primary evacuation route is via the front entrance/ door at the bottom of the main staircase. Meeting point is at the front of the guest house in the car park. We do not permit smoking in the house but you may smoke outside on the patio. Wireless broadband is available. First aid kit is available. We do not allow take-away food to be taken to any room. Address: 100 Columbus Ravine, Scarborough,YO12 7QZ. Telephone: is 01723 503218. When we are away from the house this number is diverted to our mobile phone. Mobile Phone: 07919172524. If we do not answer please leave a message on the answer machine and we will get back to you A.S.A.P. We are open all year but we do take holidays and close for Christmas.